Auckland doesn't have much in the way of Greek eateries. The few that exist tend to be Greek-and-something places like Niko's Pizza (Greek and Italian), Nicolino (Greek and Mediterranean) or Gyros Kebabs (Greek and Middle Eastern). Recently, I came across Greek Mamas, which doesn't claim to be anything other than Greek, but that is the only such place I've seen so far. In Melbourne, on the other hand, we kept stumbling across Greek food. No doubt this has something to do with the fact that the city has the largest Greek population outside of Greece (after Athens and Thessaloniki). Eating at one of these restaurants was, of course, high on our list of priorities. 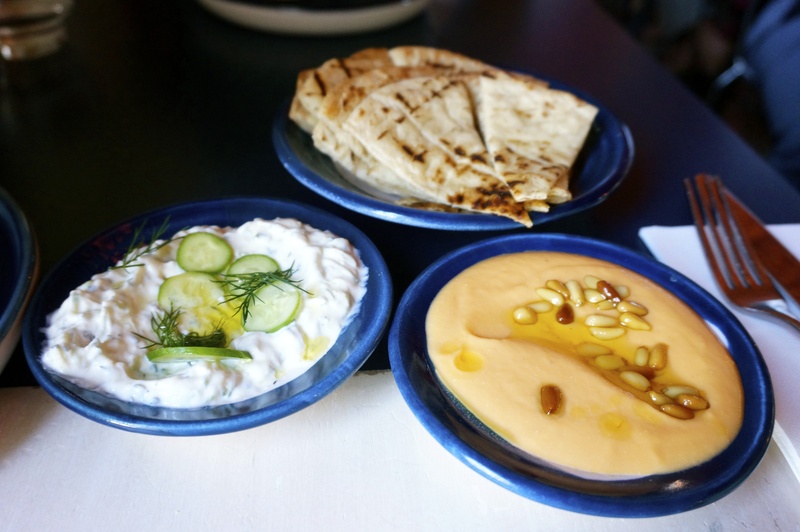 We decided to go to Gazi, as a casual Greek canteen in the CBD owned by Australian MasterChef judge George Calombaris. Apparently named after his favourite Athens neighbourhood, he calls this street food venue his playground. We turned up without a booking, not really sure what to expect. Situated in the heritage-listed former Herald and Weekly Times building, it was dark and loud, with red lines lighting the way from the bar to the dining area, where the ceiling was covered with thousands of terracotta pots. Fortunately, we got to sit at one of our favourite locations, at a counter overlooking the open kitchen. Almost straight away, we started noticing things that were very similar to Depot, one of our favourite casual eateries in Auckland. 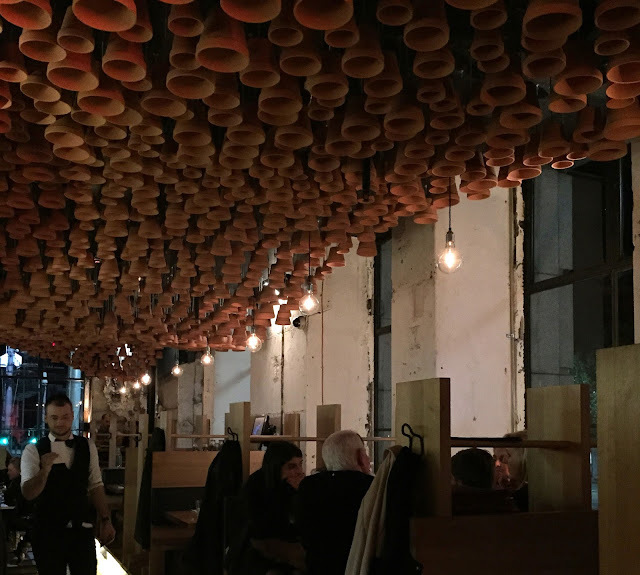 It had the same buzzing vibe, cutlery in tins, and overhead shelving containing bottles of alcohol; there was even the flat bread cut into triangles and served with dips (not free at Gazi, but you get to choose which dip you want). Cutlery and paper napkins in tins. Perhaps it was just what we ordered, but the rest of the food also reminded us of Depot. There were no oysters on the menu, but there was the woodfire grill, and an inspiring selection of vegetable sides, including Brussels sprouts and iceberg lettuce. Open kitchen next to the bar area. We assumed Al Brown must have come here before opening Depot, until we realised Gazi didn't yet exist at the time (it didn't open until 2013). Our Marouli Salad (A$9.50) was the first thing to come out after our drinks. Deceptively simple with only iceberg lettuce, oregano, lemon juice and freshly-grated cheese, we were blown away by the flavour. Our waitress explained that the kefalograviera was made with a mix of sheep and goat's milk, and we looked for something sinilar as soon as we got home, in an attempt to reproduce the dish. This was followed closely by the Garida (A$13): tiger prawns in shredded flaky pastry, perched on a bed of spicy mayo, every bit as impressive as they looked. Garida - Crispy kataifi pastry, tiger prawn, aleppo mayo, honey, smoked almond. We made the mistake of ordering from the Wood Fire Spit menu for our main dish. The chicken (A$28) turned out to be an absolute mountain of meat, more suited to sharing with friends. Although it was smoky and delicious, we wished we had gone for the smaller souvlakakia. Woodfire chicken with white beans, tyrokafteri, walnut dressing. Instead, we watched as the cone-shaped rolls flew out of the kitchen next to us, and vowed to come back and try them next time. We had a seat next to where the French head chef was working. Apart from the food, we particularly liked one of the house-made sodas, the kiwifruit and coconut one (A$7.50). On the advice of our waitress, we also ordered a light dessert called Acropolis Now (A$12.50), without even checking what the other options were. This turned out to be something like a strawberry mousse in the shape of a Greek column, and partially covered with chocolate soil. Overall, the level of cooking and service at Gazi were way up there, and we thoroughly enjoyed our evening. Based on the food we had, we wouldn't have guessed it was Greek, but then again, we've never been to Greece, and its cuisine is diverse. We would love to return and try more from the menu!